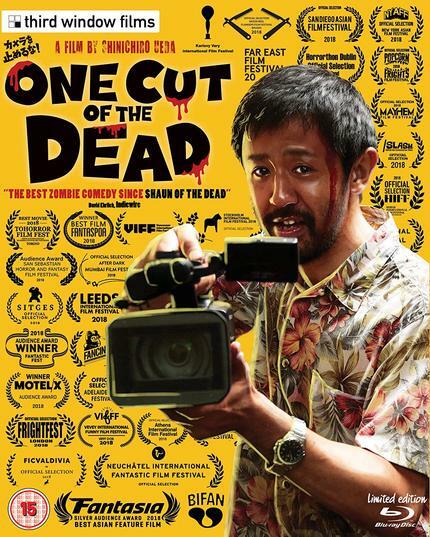 2018's surprise genre fest hit, One Cut of the Dead, is now available on Blu-ray thanks to the UK/Japan-based Asian film specialists at Third Window Films, and if any film was ever worthy of a blind buy, this is it. After spending most of last year putting audiences around the world in stitches, One Cut's journey to home video marks the first legal English-friendly viewing option for those who weren't able to make it to one of those festivals. The film, a hopelessly optimistic tale of conquering one's fears and overcoming insurmountable odds to make a movie, is perhaps one of the greatest crowd movies I've ever seen, and this release puts that experience in the hands of the people, who can now share that same great interaction and feeling of communal joy with friends and family. The film opens with a continuous 37-minutes one-take zombie film that wavers between mere charming ineptitude and downright unwatchable garbage. I know several festival programmers who did turn off the screener before this first sequence ended, before being told by colleagues that they needed to power through it because it all makes sense in the end. Without giving away too much, once this part of the film is over, the story really kicks into gear and it all starts to make hilarious sense. A layered experience that includes not only continuous hilarious recontextualization of everything you think you know about what you've already seen, but also includes several heart-warming emotional threads that will have even the coldest heart glowing with love, One Cut of the Dead is an experience best shared with as many people as you can possibly fit in your viewing space. One Cut of the Dead is not only inventive in terms of its structure, it's also brave as hell. Relying on an audience to hang with the film through nearly forty minutes of lo-fi nonsense before kicking into the real story is a very courageous tactic, but it is definitely necessary. The impact of the final reels of the film in which we get to see the magic that had to happen behind the scenes to make the opening sequence happen is a sublime, almost religious, experience that reminds me why I love movies. Normally, when I attend a film festival I make sure to seek out whatever new and exciting films I haven't seen to prioritize them over things I've either already seen or things that will be in regular cinemas. However, with One Cut of the Dead, I made sure to find space in my schedule to see it with an audience on four different occasions, just because I wanted to share that communal joy with fellow film fans, even though I knew every twist and every turn. It's a kind of shared experience that very few films achieve, and this is one of them. Shot on a shoestring budget of roughly $27,000 and mostly done in workshop, One Cut of the Dead on Blu-ray isn't exactly a demonstration piece for your expensive home theater. It is, however, as clean and efficient of an experience as it needs to be. Colors, clarity, density, and contrast are expertly rendered. In terms of the A/V experience, the film is as good as it will ever get. What really makes this limited edition Blu-ray package from Third Window Films sing is the exclusive bonus material they've put together. We get a 40 minute making of documentary that plays mostly as a fly-on-the-wall behind the scenes feature following the director and cast from auditions to workshops to on location production to festivals and beyond. It's a wonderfully insightful and efficient peek at a wholly unexpected journey of a film that exceeded all expectations. There is also a 20 minute interview with director Ueda Shinichiro, in which he talks about the production, his philosophy in making the film, how he managed on such a small budget, and his influences and love for practical effects. One of the more interesting inclusions is uncut GoPro footage captured by Ueda during the single take that opens the film, it doesn't get more meta than that. Rounding out the disc are another backstage comedy short by Ueda called Take 8 (roughly 20 minutes), a POM instructional video featured in the film, seen here in its entirety, and a trailer. Third Window have put together an excellent limited edition release for One Cut of the Dead that fans (in any region around the world, hint-hint) need to have in their collection. This gets my highest recommendation!